When I was younger, my solution to this blight on my appearance was to spend practically an hour a day obsessively and painfully squeezing every last blackhead—until my nose was as red as a tomato. It sounds excessive, I know, but I have to confess there was a certain satisfaction in seeing all the gunk ooze out. Not to mention, the gratification of having a totally blackhead free nose at the end of my squeezing session made it totally worth it. The only problem was that my “instantaneously” blackhead-free nose never lasted. A temporary fix, sure, but within a few days the blackheads would return as numerous and hardy as before. That’s when I discovered pore strips. The first time I used the pore strips I was utterly delighted: I couldn’t believe how much filth the strip managed to extract from the pores on my nose. They seemed to be the answer I’d been looking for! Of course I was wrong again. In case you don’t know, pore strips are adhesive-style fabric strips that you apply and allow to dry on your nose. 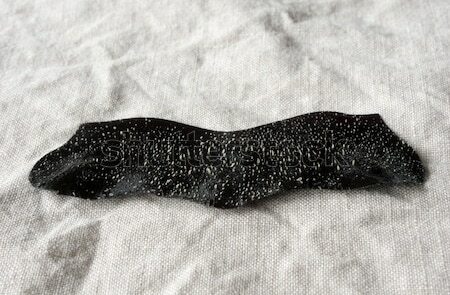 When you remove the strip, it pulls out all the icky gunk stuck inside the pores. They certainly managed to pull out as much gunk in an instant as I had managed to squeeze out in an hour, and the process was comparatively painless –not to mention it didn’t leave me looking like Rudolph. Pore strip after a removal "session"
But it still didn’t solve the problem. In fact, it seemed to somehow be exacerbating my problem skin: the blackheads were coming back and in full force—they were multiplying! No matter how much I might try to rid my face of the ugly blemishes, they just kept coming back. They had become the bane of my existence, and I really didn’t know what to do. It took me years of research and experimentation to figure out how to cure my blackheads. But I finally found a method of skin care that cured me of my blackheads once and for all! And I want to share with you the secret to blackhead free skin. If you want to know how I did it, keep reading! Sebum is a natural substance produced by the hair follicles to keep the skin and hair healthily oiled. While sebum is essential to healthy skin, it can become problematic when excess sebum gets clogged inside the pores, causing a variety of blemishes. For instance, when sebum gets clogged inside an open pore, it is exposed to the air and becomes oxidized, turning black. The result is what we call a blackhead, also known as a comedone. So, what causes the sebum to get stuck? After all, all the squeezing and the pore strips—they were ultimately only treating my symptoms, not the root cause. That’s why my blackheads kept coming back, no matter how much I emptied the pores. The cause comes from inside the body. And in order to effectively treat blackheads, you really have to understand the root cause so you can begin your treatment process there. The thing is, just as every person has a unique body with unique skin, every person will have a unique root cause for their problem skin and therefore need a unique treatment plan. That’s why we’ve designed this unique skin quiz, the results of which will automatically generate the best skin regimen to help you with your unique skin. You’ll learn how to effectively eradicate your blackheads, along with an entire overview of your skin in general and the best way to care for it. Take the Skin Quiz to Determine the Cause of Your Blackheads and Your Personalized Course of Treatment – it’s like a personal consultation from the comfort of your couch. With the quiz, cosmetic experts have done all the work for you by creating a simple digital cosmetic history to interpret your treatment needs. It’s like having a consultation with a beauty expert from the comfort of your couch. Combining years of experience and patient histories, the quiz factors in your environment, your natural tendencies, your personal skin goals and then immediately generates the most ideal skin regimen to give you the beautiful and glowing skin you crave—totally blackhead-free! You may have been born with blackhead-prone skin, but it doesn’t mean you have to live with them. Once you understand your particular skin type and the internal source of your skin’s blackhead tendency, you can take the appropriate action towards having beautiful skin. Below are the 3 primary reasons why some people are naturally prone to blackheads, along with actionable solutions that you can use to effectively reduce your blackheads. Clean, glowing skin is within easy reach! 1. Oily skin is perhaps the most common cause of blackheads. When your skin produces more oil than is necessary, the extra oil accumulates inside the pores, leading to blackheads and other blemishes. If you have oily skin, you’ll want to start treatment from the perspective of reducing the amount of oil your skin produces. This, in turn, will ensure that the excess oil and sebum doesn’t get stuck inside your pores. Though it may sound counter-intuitive, washing your face too often is not the answer. In fact, over cleansing is the primary cause of oily skin. How does that figure? Well, the skin naturally produces oil, or sebum, in order to protect itself. The oil supports the skin’s immune system and helps maintain healthy bacteria while discouraging harmful bacteria. Oils also help the skin prevent moisture loss from the body—one of its primary roles. When you wash with soap, you strip the skin of this protective barrier. Your skin, in an effort to come back into equilibrium and protect you, will try to compensate for this stripping by producing more of its own oils. Therefore, if you want your skin to produce less oil, you have to stop stripping it of oil—i.e. : Don’t Overwash Your Skin! The first are the ingredients that moisturize skin by creating a barrier that prevents water from escaping—if you have oily skin, the oil in your skin already provides this barrier, so this type of moisturizer won't do you any favors. The second sort of skin-moisturizing ingredients work by actually pulling water particles from the air into your skin. Since oily skin tends to have too much oil and not enough water, this is the best moisturizer for you oily-skin types. Apply the moisturizer when you have a damp face and it will pull the water deep into your epidermis, plumping your skin and keeping you hydrated all day. How do you know which cleanser and moisturizer ingredients will best suit your skin type? The skin quiz will tell you that, too! 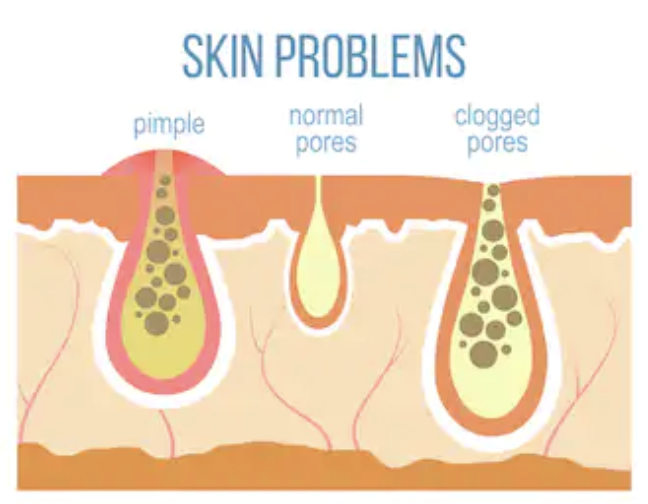 If you have a combination skin type with blackheads, it is usually not excess sebum that is clogging your pores, but the fact that the sebum has a particularly thick texture. Sebum contains both saturated and unsaturated fats. While saturated fats stay solid at body temperature, unsaturated fats are liquid. The density of your sebum is therefore dependent on the balance of saturated to unsaturated fats. The more saturated fats, the thicker your sebum. The thicker your sebum, the more difficult it is for the oils to flow out of the pores. The obvious result is that the sebum remains stuck inside the pores, where it turns into blackheads and acne. People with thicker sebum tend to have inflamed acne along with blackheads and whiteheads. Most acne and blackhead products are designed for oily skin and tend to be too drying for people with combination skin and thick sebum. This can make it difficult to find a solution. But don’t worry—we’ve got you covered. If the underlying cause of blackheads is thick sebum, the best approach for treating it is to thin the sebum. You can thin the sebum by balancing the level of saturated and unsaturated fats in your skin oil. One strategy is to use skincare products that contain ingredients with high levels of unsaturated fats—such as lineloic acid—which can help thin out the sebum. When choosing a facewash, look for an oil-based cleanser. Oil dissolves oil and is far more effective than soap for cleaning out thick, stuck sebum from deep within the pores. And it works without drying out your skin—an extra bonus! If you’re confused about which ingredients are best for your particular skin, take the skin quiz: https://y-ourskin.com/quiz/ Our quiz will offer you a guide on how to care for your skin and offer suggestions on the best products to treat your skin concerns. In addition to using the appropriate skincare products, you’ll also want to consider your diet and fitness habits. Diet and exercise make a massive impact on the health of your entire body— that includes your skin! As mentioned, saturated fats are solid at body temperature. Therefore, the more saturated fats in your diet, the more likely you are to have clogged arteries and thicker sebum. By reducing saturated fat and processed foods in your diet, you will not only be healthier through and through, your skin will have fewer blackheads! You’ll also want to eat foods that are high in vitamin A and omega-3, since they will naturally regulate your sebum production and sebum texture. As for exercise, we all know that it makes you fit, increases your endorphins and brings oxygen into your body, making you look vibrant and healthy. But it also makes you sweat—and sweating is far more important than you may realize. In fact, sweat is essential to maintaining healthy skin. You see, sweat glands and sebaceous glands both secrete their respective fluids into the pores. This means that when you sweat, you flush out clogged sebum, dead skin, dirt and toxins that have collected inside your pores. You may have noticed that your face is smoother after a workout, glowing with natural luster, or that people who work out regularly have beautiful skin—this is thanks to sweating! Just be sure to wash your face after your workout of all the dirt that you’ve flushed out of your pores: you don’t want it to sink right back into your pores along with unfriendly bacteria that causes acne! Another potential reason for blackheads is that your skin doesn’t exfoliate as quickly as it should. Skin grows in layers, with the newest skin on the bottom most layer. As the new skin turns over, it pushes old skin out. The old skin should shred off (or exfoliate). However, for some, the old skin fails to shred, instead remaining on the surface of the skin, clogging pores. Now the sebum is trapped inside the clogged pores and it accumulates, causing blackheads, whiteheads, and acne. Luckily, the exfoliation problem is an easy fix: If your skin is not exfoliating itself, you simply need to help out by doing the exfoliation manually. Salicylic acid, a natural chemical extracted from willow bark, is an excellent ingredient for exfoliating because it can penetrate deep inside the pores, where it clears out both the compacted dead skin as well as the top layer of dead skin. While stronger exfoliation scrubs can also be useful, you’ll want to be careful when using them because they can cause tiny tears in your skin, which can in turn become infected, causing acne. You’ll also want to be extra cautious of the ingredients in your scrub—be sure it does not contain micro plastic beads which are not only harsh for your skin, but wind up polluting the water systems, hurting marine life and damaging the environment. If you want to know which ingredients are best for your unique skin type, take our skin quiz! You’ll receive a personalized summary of your skin needs, with suggestions for the best products that will make your skin feel nourished and look gorgeous. In addition to internal causes of blackheads, there are also a number of external factors that can contribute to problem skin. These include your diet, your living environment and the way you care for your skin. There are a ton of products and popular skincare folk remedies that really do more damage than good. It’s best in these cases to just stop the bad habit and let your skin return to a natural state of equilibrium. Normally, it takes a week or two for your skin to adjust when cutting out a habitual treatment. For example, remember the pore strips I was so happy about finding before? Well, what I didn’t know at the time was that the reason my blackheads were getting worse was because every time I used a pore strip, I wasn’t only pulling away clogged sebum—I was also stripping away the healthy cells around my pores. In effect, this meant that my pores were actually enlarging, meaning even more sebum could become compacted inside. So in the end, my blackheads were getting worse and worse and I kept buying more and more pore strips! Great for the pore strip company, bad for my skin! Squeezing blackheads is nearly as bad as strips. If your blackheads are so bad that you require extraction, use a blackhead extraction tool or get it done by a professional. Another bad habit that can cause blackheads to proliferate is over-washing the skin. As mentioned above, too much cleansing will actually strip your skin of its natural, nourishing and protective oil. When the skin is stripped in this way, it reacts by overproducing sebum, which leads to oily skin which you to want to wash more. And thus a vicious cycle is in place. Resist washing your face more than twice a day! And of course, you’ll want to be wary of using skin care products that contain ingredients which can actually exacerbate or cause acne. For example, comedogenic products are made with low-grade petroleum and are terrible for oily or combination skin types. This petroleum is typically used by low cost makeup and skin care companies because it makes the products go on smoothly. However, it works by creating a barrier between the skin and the outside world, effectively blocking pores and trapping sebum inside. As more sebum accumulates inside the follicles, the pores will begin to stretch, becoming larger over time. Be sure to use high quality makeup and skincare to avoid petroleum and paraffins in the ingredient list. How do you know which cleanser and moisturizer ingredients will best suit your skin type? The skin quiz will tell you that, too - complete with step-by-step instructions making it easy for you to nurture your skin the way it likes. Another external factor that can lead to blackheads is diet. As stated before, sebum (aka skin oil) contains both saturated fat and unsaturated fat and the composition of your sebum depends primarily on your hormones and diet. You’ll likely notice the hormone response during puberty, when getting on/off birth control, during and after pregnancy, and at menopause—times when you will be more or less prone to getting blackheads and acne. While you cannot control your life phases, you can seek help from a doctor if you think your hormones may be out of equilibrium. In the meantime, you may want to consider that dairy products (milks, yogurts and cheeses) contain trace amounts of hormones which have been shown to have a negative effect on human hormone levels. This can cause all sorts of issues, including acne. Whether or not you suffer from hormone-related acne, it’s a good idea to consume dairy from cows that are not treated with hormones. You’ll also want to avoid processed foods, which are full of saturated fats. As mentioned above, saturated fats become solid in the body causing both clogged arteries and thicker sebum—which in turn leads to clogged pores and acne. Replace the saturated fats in your diet with healthy oils such as olive and sesame. The cause of your blackheads could be any one or a combination of the above stated causes. Through our uniquely designed algorithm that combines years of professional experience with hundreds of cosmetic clients, the skin quiz will determine the cause of your acne—whether it is due to oily skin, thick sebum, lack of natural exfoliation or some combination therein. Take the skin quiz to determine which type of skin you have and we’ll help you find the perfect solution to your unique skin challenges!